Medea is a project designed by Spalvieri & Del Ciotto Design Studio for a competition conceived and organized by Hermès, a french luxury brand. The goal of this competition is to create a decorative product with a distinct playing component. 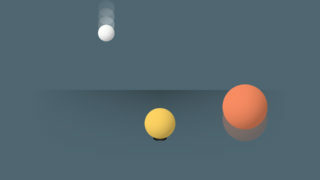 The object is composed by two simple elements: some spheres and the lever. The spheres have different sizes and materials (wood, metal, stone). The smallest sphere is made of the heaviest material and the largest sphere are made of the lightest material; this exchange create in the user a sense of confusion. The purpose of the game is to balance all the elements. We decided, to narrate this project and its simplicity, designing a short video in digital stop motion. We designed, in a vector way, every single frame (about 180 frames), then we put them in sequence and edited the video. Eureka! The naming of this product derives by an anagram of the name of Archimede, a Greek mathematician, physicist, engineer, inventor, and astronomer, who formally stated the correct mathematical principle of levers.